Sneak Peek: Arai VX Pro 4 Helmet! 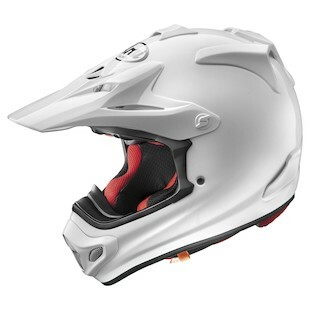 The current crop of off-road helmets not premium enough for you? There’s something just over that table top that may pique your interest. For the most serious of dirt riders, Arai has a treat for you: the long-awaited VX Pro 4. Maybe you’ve been spoiled with comfortable lids. Maybe you’re tired of wearing your older brother’s sweaty brain bucket. Maybe you’re an impulsive shopper and want the best of the best. Whatever your creed, the new Arai VX Pro 4 Helmet will be sure to impress. For starters, all the external hard parts are designed to break away from the super-strong shell. You won't have to worry about your peak getting caught on a branch and create a whole mess of problems for you and your spine. A redesigned interior means the VX Pro 4 will feel like you have a kitten on your face . . . only it isn’t a kitten, but one of the best dirt helmets in existence. An extremely wide eyeport lends to great panoramic field of view and the ability to accommodate even the largest goggles. Redesigned venting, including an all new chin vent, are intended to keep your noggin cooler than ever. And because they’re so dangerous, you need the most premium of premium helmets - the Arai VX Pro 4. Stay tuned for more info, more pictures, and more kitten metaphors!